A small forecourt now positioned away from the A2. The former Tollgate Garage positioned on the old A2. This garage is positioned at the historic junction of Watling Street and Wrotham Road. There was a turnpike here, and the Turnpike Inn (later Tollgate Motel) was built opposite - it's now closed. In 1968 the A2 through here was widened, and Wrotham Road diverted onto a new alignment. 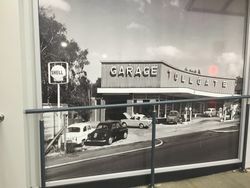 The Tollgate Garage opened next to the eastbound A2, positioned at the old junction. In 2009 the road was upgraded again, and moved south on to a new alignment. This meant the garage was now isolated on an old section of road, but it also meant traffic leaving the A2 in either direction could get to it via the improved junction. There is a Morrisons with a café and filling station as well as a Toby Carvery and Travelodge also at the junction. The filling station was formerly branded as BP. Since 2017, BP Express have submitted three planning applications to the local council for a BP-M&S combo site and two-storey McDonald's drive thru to be built here. However, the current forecourt owner appealed against this and the plans were scrapped. 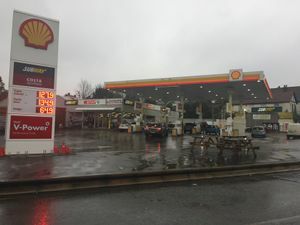 The filling station was redeveloped and reopened in March 2017 with an extended Spar store and a larger Subway franchise, as well as a new Favorite Chicken franchise.